There are a few things that are fundamental to flatheads. First off, flatheads are called flatheads because their heads are more or less flat. That is because they don't have valves in them. The valves are in the block beside the pistons rather than over them, the valve stems point down rather than up, and the heads of the valves are up rather than down. All this is in contrast to an overhead valve engine. Now it gets interesting. If you are used to a flathead lawn mower engine, like a Briggs and Stratton, the valves are parallel to the cylinder and the crankshaft is centered on the cylinder. It's all squared up. On a Ford/Mercury flathead, the valves are not parallel with the cylinders and the angle isn't the same from side to side. This is clearly visible when you pull the heads. The camshaft is not centered on the crankshaft and the crankshaft is not centered on the cylinders. When I first saw a disassembled flathead V8, I thought it was manufactured wrong. Right or wrong, that really is the way Ford made them. The exhaust ports run through the block and the center exhaust ports are "Siamesed." That is why there are only three exhaust ports on a side. Rumor has it that Henry Ford was more concerned about warming the engine up quickly in cold Detroit winters than he was with keeping it cool on a hot summer day. The exhaust ports coming through the block sometimes makes it a challenge to retrofit a flathead into a dragster frame built for another kind of engine. The exhaust can end up pointing at a frame rail. 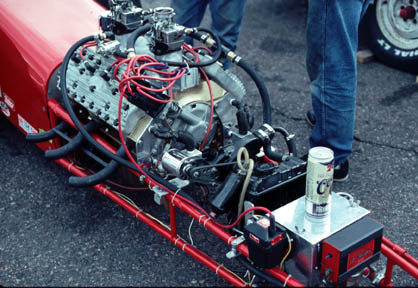 You can see some solutions to this in some of the pictures in other places on this site, including Marv Brown's dragster. The flathead changed through the years. There were versions with 21 head studs and versions with 24 studs or bolts. They were made with 221 cubic inch displacements, 239 cubic inch displacements, and 255 cubic inch displacements. The latter was the 1949 and later Mercury engine with the much desired four inch stroke crankshaft. Ford also made a small 60 horsepower flathead V8 as an economy version which was once popular for midget racing, and a huge 337 cubic inch V8 for Trucks and Lincolns. Of course, there were inline four and six cylinder flathead engines and the Lincoln V12s, but they really aren't the subject of this page. The 239/255 cubic inch "24 stud" engines are the most popular ones for hot rodding. These were made between 1946 and 1953 in the United States, and through 1954 in Canada and Australia. There are two basic types of these engines which I will refer to as early and late. The change was made in 1949 in Ford and Mercury cars and in 1948 in Ford trucks. They are easy to tell apart. The early engines had half of the bell housing cast into the block, the distributor mounted to the front of the engine with its shaft lined up with the camshaft, and the heads had water outlets in the center. The late engines had bell housings which were entirely bolted on, the distributor pointed up and to the right perpendicular to the camshaft, and the water outlets were on the front of the heads. The late heads used bolts rather than studs. There were other differences, but these will help identify the engines. The way Ford counted cylinders is different than you might be used to. Cylinders 1-4 are on the right side and cylinders 5-8 are on the left side. Cylinder #1 is the first one on the engine's right side. It is not the one farthest forward. In the late style engines it is the one closest to the distributor. The firing order on all flatheads is 1-5-4-8-6-3-7-2. And, don't forget how Ford counts those cylinders. The counter intuitive way the cylinders are numbered makes for some funny-looking stuff on the bottom end of the engine, too. So, when you look at the rods attached to a flathead crankshaft, the order from front to back is 5-1--6-2--7-3--8-4. The single dashes indicate rods which share a throw on the crank. The double dashes represent going to the next crank throw. Tearing Down Grandpa's Flathead Follow along as I take apart my grandfather's 8RT flathead. Cracked Blocks The bane of flatheaders. Here are some examples. The Mercury Four Bolt Carburetor I don't know much about them, but this is what they look like.